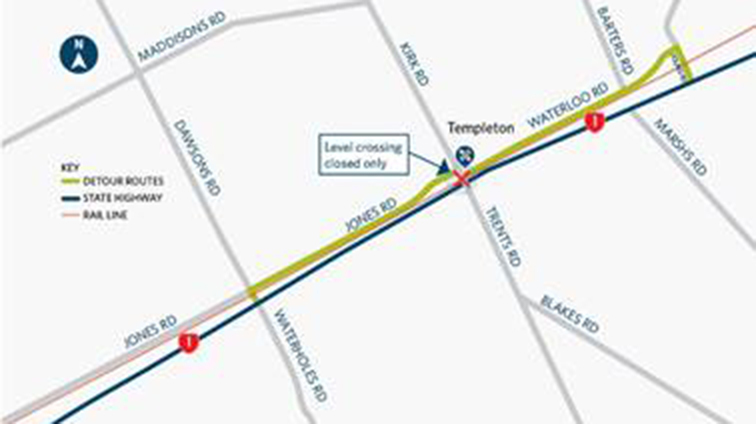 The railway crossing on Christchurch’s Kirk Road, Templeton, near State Highway 1 will be temporarily closed, with detours in place, on the weekend of April 6–8. The NZ Transport Agency and KiwiRail are replacing the railway tracks on the crossing and renewing the road surface to make it smoother and safer to drive across. The Transport Agency’s system manager Peter Connors said the crossing will be closed to all vehicles, with a short detour in place, from 6am Saturday, April 6 until 6am Monday, April 8. Workers will help pedestrians use the crossing safely. Mr Connors said those working on the crossing upgrade would endeavour to carry out the work as quickly and as efficiently as possible to minimise any disruption. “These improvements are part of the Safe Network Programme, delivering safety improvements on high-risk routes across New Zealand to make roads more forgiving of people’s mistakes. “The programme focusses on safe roads and roadsides, safe and appropriate speeds and safe level crossings,” Connors said. After the work on the crossing surface is complete, new barrier arms and clearer signage will be installed, and the existing pedestrian crossing will be upgraded.